The Resource Land Unit (RLU) application validates farmers' acreage immediately, so it now only takes minutes to apply for crop insurance instead of hours. To help farmers recover from the combined effects of the Great Depression during the 1930s and the simultaneous prolonged drought that struck the United States' Great Plains region, US Congress created the Federal Crop Insurance Corporation (FCIC) in 1938. Wholly owned by the US government and managed by the US Department of Agriculture's (USDA) Risk Management Agency (RMA), the program helps the agriculture industry remain economically stable by supporting and regulating crop insurance. "The agency reinsures private Approved Insurance Providers who actually administer the crop insurance policies for the individual farmers," explained Justin Koppa, a geographer with the RMA. "The RMA also oversees the entire crop insurance program through the FCIC, and last year we insured 282 million acres of crops and $102 billion worth of insurance liability." In the past, confirming a farmer's acreage for crop insurance was often a protracted process. But in 2015, the RMA developed an ArcGIS software-based application, called the Resource Land Unit (RLU) application, that provides farmers with immediate verification of their acreage when applying for crop insurance. What used to take months now takes minutes. Here's how applying for crop insurance used to work: First, a farmer would submit details about the acreage that needed to be insured to the local Farm Service Agency (FSA) using hand-drawn sketches over existing maps or aerial photography. The agency added that new information to its GIS database, and then the farmer would complete an application for crop insurance with his or her agent. The crop insurance agent would use the Common Land Unit (CLU) database provided by the USDA to complete the application. From there, the RMA would send a response back to the Approved Insurance Provider indicating either that it would underwrite the insurance policy or that more information was needed to process the application. The whole procedure was time-consuming for the RMA because the CLU database includes more than 37 million polygons that are continually updated, so some of the information is out-of-date while, in other cases, the existing data had been incorrectly entered. A CLU is the smallest area of land with unvarying land cover and land management practices and a permanent contiguous boundary, which can include fences, rivers, tree/forest lines, roads, and other similar features. To include a CLU in the USDA database, the CLU is digitized using the existing orthophotography of the area from the National Agriculture Imagery Program (NAIP). CLUs are stored in an ArcSDE enterprise geodatabase for documentation and verification purposes. While farming may seem like a fairly static operation, with the same crops planted on the same acreage year after year, it is actually very dynamic, according to Abdul Syed, a senior geospatial developer with Planned Systems International and a consultant on the development of the RLU application. "Because farmers plant different crops in different seasons on the same field—depending on agricultural prices, weather conditions, and other variables—the CLU database is constantly being updated by the FSA, particularly because there are many gaps in the database," said Syed. "For example, not all agricultural products are insured by the FCIC program. One year, a farmer may plant a crop that is insured. Another year, he may plant a different crop that we don't currently insure. Or, during a very wet season, a farmer may not be able to cultivate a field that was in production the year before. So all of this needs to be reflected in the CLU database. There are also attribution errors in it. This is why the RLU application is so important. It provides farmers with an immediate validation of their acreage for crop insurance purposes." "The RLU application uses the acreage measurements recorded by the farmer's precision [agriculture] equipment," said Syed. 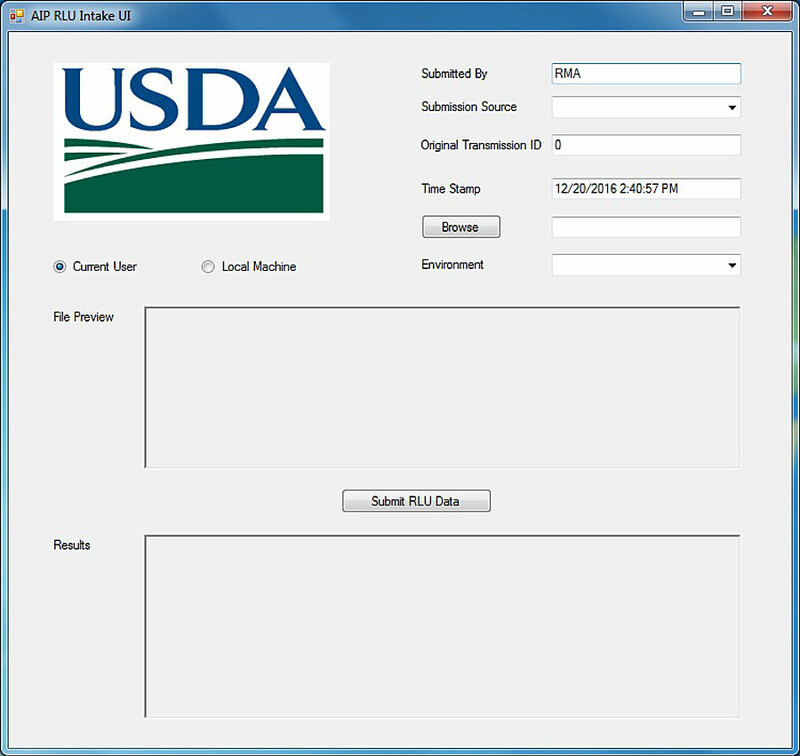 "This data is sent by the farmer directly to the crop insurer, who submits it to the RMA. The RLU application can also use data provided by the GPS coordinates of a field or the field boundaries digitized from NAIP orthoimagery. RMA then validates the acreage as a Resource Land Unit. With RLUs, the boundaries aren't permanently fixed, as they are with CLUs, so you can easily specify revised field boundaries when necessary, and RMA will validate it as an RLU. This gives RMA the most current spatial data available for crop insurance purposes." "The process we use for the RLU file conversion is fairly straightforward," added Koppa. "The GeoJSON record is first converted into the ArcJSON format. Then, the ArcJSON file is converted into an ArcSDE feature class. This is the file we use for our series of acreage validations. The first validation is to make sure that all the attributes are correct—that the attributes have the required values in them. In addition, we make sure that the geometry is valid and doesn't have any gaps. If our validations determine that the record is clean, we assign it a unique ID. We return a JSON file with the unique ID that the [Approved Insurance Provider] can link back to the RLU geometry and utilize immediately for obtaining a crop insurance policy. ArcGIS Server maintains our geodatabase so that we can perform the real-time validation the farmer needs for insurance and crop reporting purposes." The RLU application now gives Approved Insurance Providers and local farmers access to real-time feedback and real-time validation when applying for crop insurance. "The RLU application is really revolutionary," said Koppa. "Up until now, data management, data remediation, data validation, and data feedback were all taking a lot more time and a lot more resources—a lot more human interaction." With this new application, however, an Approved Insurance Provider can set up an automated system to submit the GeoJSON file, and the RLU application can process it automatically at any time of day. "[This] is really benefiting the farmers, the insurance providers, and the RMA," concluded Koppa.